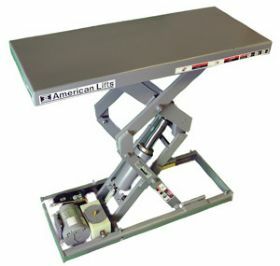 Designed and Manufactured in the USA for over 30 years. Product No. Travel Cap. (lbs.) Lowered Height Raised Height Standard Platform Size Max. Platform Size Max. End Load @ Std. Platform (lbs.) Max. End Load @ Std. Platform (lbs.) Max. Side Load @ Std. Platform (lbs.) Max. Side Load @ Std. Platform (lbs.) Raising Lowering Time (sec.) Power Unit/HP Wt. (lbs.) Price Ea.